Ah! So I had another go at making paper yesterday! I used scrap computer paper with a bunch of those annoying little paper subscription postcards that fall out of magazines for a base. These are the textures I came up with: 1. Feathers and Bay Leaves 2. Plain with nothing else in it, base only! 3. Red cotton fibers with red flower sequins 4. Mickey Mouse punches with stars 5. 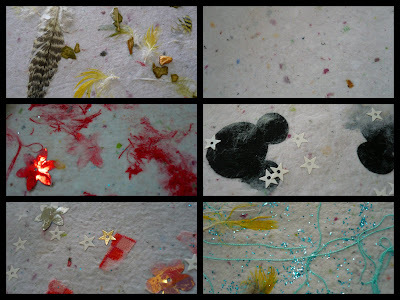 Cotton fabric confetti with stars and sequin flowers 6. Feathers, glitter, and blue cotton thread! Here are all of em lined up! This was so fun.... I've already used the plain sheet in my art journal to makes some clouds.